Searching the Web from a mobile phone is increasingly part of everyday life. Looking for some new sports equipment and not sure where to go? Just type it into your smart phone, and you’ll get a list of businesses eager to sell you their products. One thing you can be sure of: If you like fast and easy information, your prospective customers feel exactly the same way. So if you own a business dependent on local traffic, you’ll want to be right there on people’s phone screens when they’re searching for what you sell. Getting there is pretty simple: Claim your business listings on all the major search engines – Google, Yahoo and Bing. 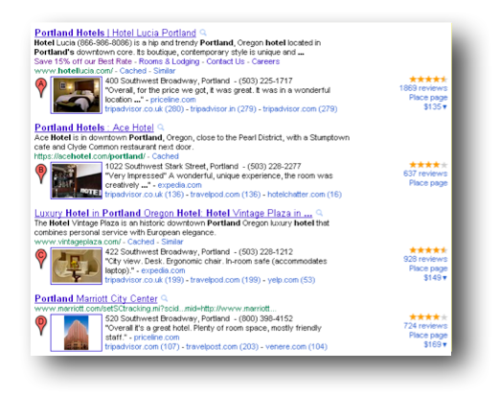 Each of these search engines returns local results when someone searches for a product or service. You’ll have a much better chance of appearing front and center in mobile search results if you claim and optimize your business listing. You should create your Google Places listing before your Yahoo and Bing listings for several reasons. First, Google is the most widely used search engine, and its local listings – called Google Places – include a mobile app. Second – but no less important - Google recently rolled out product listings, which help searchers find products available in their area. If you provide Google your product availability data, your Google Places page will display products available at your store. It’s a great way to introduce what you’re selling to people who don’t know your business yet. Claim your business listing using a business email address. Don’t use a @gmail.com address – instead, use a @mybusinessname.com address. This helps strengthen the trust Google has in the authenticity of your listings. Make sure you list business categories that are relevant to your store. For example, if you sell sporting equipment, use some variation of “Sporting Goods Store” as one of your categories. Use the city and state where your business is located in the description. Use a page from your website that includes the address and phone number of your business on it as the website link on your listing – for example your “Contact Us” page. Keep all important location information, such as business name, address and phone number, consistent across all local listing platforms. This sends a strong signal to search engines that your local listing is legitimate, and that the information is accurate. Your consistent information creates greater trust in your listings and site, and that ultimately helps your rankings in search results. 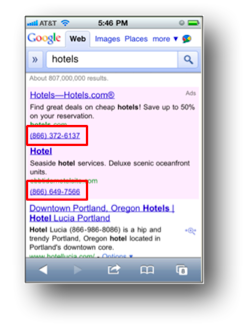 If you decide to use Google’s pay-per-click advertising program - called AdWords - be sure you add Click to Call. People using their phones to search often want to locate something quickly, and Click to Call offers them a one-step option to get in touch with you. Click to Call lets you set up ads that allow someone to simply click your business number and call you directly from your ad. It’s so easy that a shopper is much more likely to call you than a competitor whose number isn’t as readily available. Click to Call is easy to set up in the AdWords campaign settings. All you need to do is set up location extensions and provide your phone number. Don't know how to set up AdWords yet? Read Google AdWords Guide for Beginners. To make things even easier, you can link your Google Places listing directly to your AdWords account, and your location and contact information will automatically be included in your ads. Next, make sure you’ve chosen to show your ads on iPhones and other mobile devices that have full internet browsers. That’s it – once you complete these few easy steps your customers will be able to call your business with the click of a button.